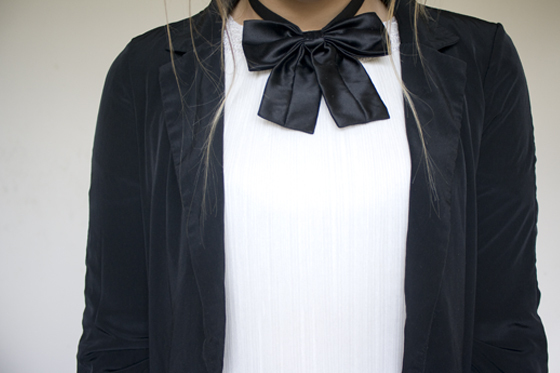 That neck-tie is such a simple, yet clever idea, it makes your outfit look so nice!! love the nails, i'll definitely be trying them out soon..
& the little neck tie is cute! Your necktie is so cute! Dalmatian nails are so easy too :) I did some last week. I've been a little dalmatian print crazed myself, your nail art is just super cute! I will have to try that out sometime. And your bowtie is darling. Love this combination, especially the necktie! Looks like I'll be heading to Primark some time soon! Wish I had a Primark near me! I fall in love with your rings every post! love the nails what a good idea! the necktie is so lovely and your nails are so adorable *_* love the pattern! wow, really love nails, amazing! i wish i had the patience to do my nails all the time. mine are always natural and i'm always jealous when i see girls with their nails done well. I like the neck tie! Totes doing dalmatian nails tomorrow morning! I've seen them around and I love it. Excited to start seeing dalmatian print in the shops, too! Lovely look darling! Love the necktie and the blouse! Such a lovely look. I love your nails and the necktie. I have that blazer but in blue and love it, a lovely fit I think. Nice added bow tie also! I just did dalmatian nails as well, that print is everywhere! Love your nails, great rings! cannot even express my love for this into words! The nails are adorable :). Your nails are sooo lovely!!! What a fun outfit, I love the neck tie! I love your nails it's so fun ! That Necktie is so cute! Literally just written a dalmation nails tutorial to go up next week! Love it as a look. ooh this dalmation nail trend looks like something i could manage! i could never pull off the polka dot one because all my dots would never be the same size haha. What a cute look, I'm loving the fact Dalmation print is all over the runways this season... I might hav to steal that nail design Lily, they look stunning! I love the Dalmatian print, just did a little post about the Dalmatian items at Topshop! I love your blog. I am trying to do the same type of blog myself! You are an inspiration!!! Hi, I've just started blogging and discovered yours! I'm very impressed with your nails - mine always end up a smudgey mess - and the monochrome look your outfit has, tres chic!